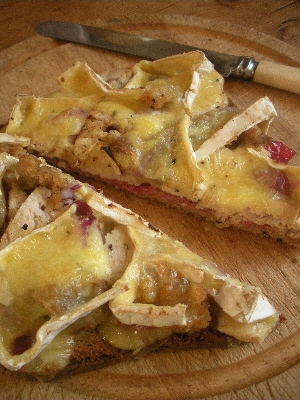 Turkey all eaten, apart from the best bit: the leftovers to be had on toast, with plenty of stuffing, Cranberry Relish and some Cooleeney camembert (from the Tipp Producers night) melted on top. The deed has been done and it’s much quieter in the garden now. 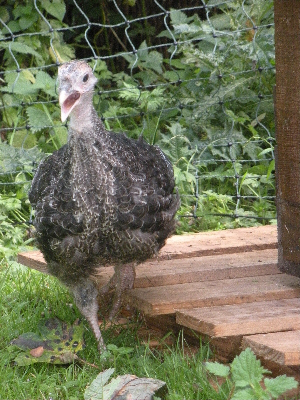 No more turkey gobbling in response to Little Missy’s shouts or the hens’ triumphant I’ve-just-laid-an-egg crowing. Time is running out for our terrible turkey twosome. They’re much larger than when they arrived – a little bit taller than a Little Missy at this stage – and strut about the garden as if it is their own especial fiefdom. They were eight weeks old when I picked them up from poultry specialist David Kelly; now, almost three months later, it’s nearly time to say goodbye. 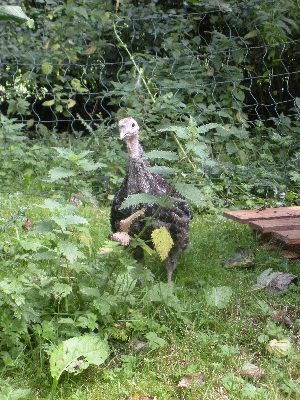 As published in the Irish Examiner on 2 October 2010.“They’re rather…ugly,” said Scott, aka the husband, gazing intently at the pair of awkward-looking eight-week old turkeys that he had just wrestled from the boot of my car into their new home. All long legs, ruffled feathers and indignant hissing, they huddled together in the back corner. “We’ll have no problem eating such awful looking birds!” he added with satisfaction. Eighteen-month-old Hannah, fascinated with any animal that crosses her path, wanted to join them in the house but they were having none of it. 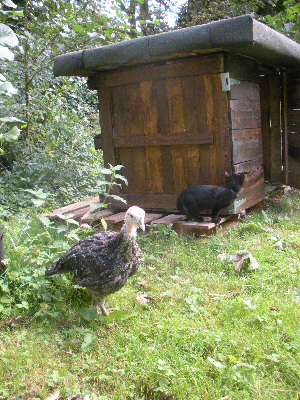 A few squawks quickly saw her off and she was easily distracted with her regular playmates: the hens and cats. Thankfully, there would be no love lost there either. It’s a little early to be getting into “the turkeys have gone to help Santa get ready for Christmas” explanations. 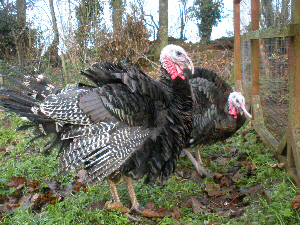 Irish Examiner: Turkeys – really, really stupid or just misunderstood? Barbara Kingsolver may be responsible for propagating the myth that turkeys are so suicidally dumb that they can drown just by gazing skywards as it rains but a quick online search will soon see you right. In 2003, Tom Savage, a poultry scientist at Oregon State University tried to get some respect for the turkey population by explaining that the only reason turkeys stare at the sky is because of a misunderstood genetic nervous disorder. According to his observations, the birds were no less intelligent than any similar fowl. I beg to differ. A winter warmer? 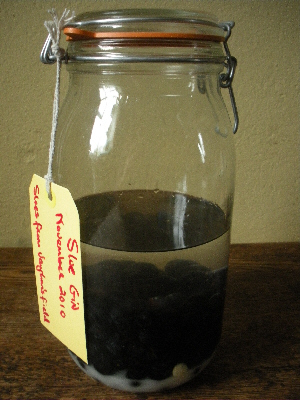 It’s just got to be Sloe Gin. The first time I tasted it was in 2002 when the then Boyfriend and I were staying with the IT Specialist near Cambridge and an unlabeled bottle was produced late at night. I savoured every last drop and remembered enough the next day to ask our friend for his grandfather’s recipe. As I remember, it was along the lines of “half fill a bottle with sloes, add sugar and gin. Shake every day and then strain through a gorse.” A gorse? I hear you ask. Well, Chinese whispers meant that there was something lost in translation between the English grandfather and the Irish girl demanding the recipe. 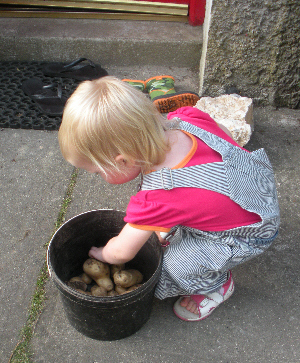 I thought he must have some kind of “traditional” knowledge and quietly determined to use a sieve myself. It was only months later that we discovered that he had meant gauze rather than an actual branch of a gorse bush. So much for traditional knowledge. This has been a rather mixed year in the garden. Despite all my busy sowing early in the year, there wasn’t a whole load to harvest after those pesky rabbits got stuck into all the tasty green shoots. Still, the arrival of four cats (and the occasional extra stray or two) has put a stop to the dozen or so rabbits that we used to see in the mornings, carvorting in and around the raised beds, and we have managed to get our hands on some of our own garden produce. These turkeys have legs! 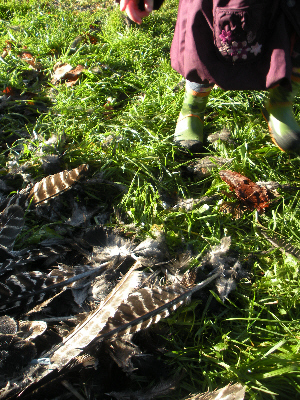 After a call from a Newstalk researcher on Friday, I was on the Tom Dunne show yesterday morning, talking about keeping – and harvesting – turkeys for Christmas.